Deciding that you need long-term care can be one of the most difficult decisions you’ll ever make. If you haven’t prepared for the possibility of long-term care before you need it, it can be even tougher. In addition to having to scramble to find the kind of care that is right for you, you will also be faced with large bills that can quickly eat through your savings. For help planning for your long-term care, contact Safe Harbor Wills & Trusts in Syracuse and Watertown. Our firm is dedicated to helping people protect their assets and plan for the future, especially as they get closer to retirement age. By preparing and planning ahead of time, you may be able to salvage not just your money but your dignity, too. Long-term care can take many forms. For some people, it means having regular in-home care (medical or otherwise), while others may need to live in a retirement community, or a nursing facility. Everybody is unique and the same is true of their needs, so it makes sense to have several options ready to go in case you do need help. While it is impossible to know which, if any, kind of long-term care you may need, the costs can be staggering. Over the last few decades, the cost of both in-home care and live-in facilities have increased so dramatically that most people just are not prepared for even minimal care costs. Without proper preparation, you may lose everything you have worked for in order to pay your bills. Certain kinds of insurance as well as early financial planning may make it possible to live the kind of life you want for as long as possible, and still leave something for your heirs. YES. A lawyer, especially a lawyer who has years of experience in asset protection, estate planning, and elder law, can make the difference between having a long-term care plan that works, and being completely underprepared. Contact Safe Harbor Wills & Trusts. Our firm is unique in that we have dedicated ourselves to these specific practice areas. We have seen firsthand the kind of financial damage that the costs of care can have, and we want to help you prevent the same kind of disasters from happening to you. When you sit down with our attorney to discuss how to prepare for the future, you can discuss all of the options that are available to you. By planning early and considering long-term care insurance as well as trusts and other asset protection measures, you may be able to navigate these choppy waters easily in the future. 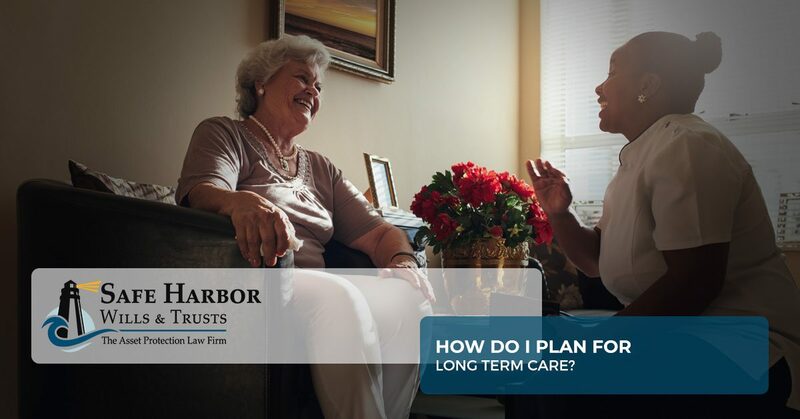 Don’t wait any longer to start planning for long-term care. In many cases, if you need the care now, it may be too late to do anything to protect your assets, so prepare ahead of time in order to receive the best benefits. We are always here to help, so please call us today.